Hop, Hop – It’s A Coffee Lovers HOP! Hello and happy Monday everyone! I’m changing things up a bit this week. Dare 2B Artzy is a super sponsor of the Summer Coffee Lovers blog hop and although this is my off-week for Dare 2B Artzy, I couldn’t miss out on this awesome hop! I mean, its coffee and paper crafting after all and paired with Dare 2B Artzy stamps that makes it better than a double espresso. I started off this card with a stitched square die measuring 4 1/2 x 4 1/2 which I used to cut some Dare 2B Artzy paper from the Blissful Blooms paper pack. Next, I cut a second stitched square from some off-white 110 lb cardstock. With my second square cut, I was then ready to add a fun little border cut with fringe. I discovered this die called Fringe Scalloped Border Die from Lil’ Inker Designs and I love it more in person than when it landed in my shopping cart. It’s just adds a fun little element to your card design. LOL! The fringe scalloped border die comes with 3 different borders so you can cut a wavy line, a simple curve or a straight line. For my card today, I decided to use the wavy die because it gives me an opportunity to give a peek of the paper that’s underneath the off-white cardstock. I absolutely love this look. I adhered the now scalloped fringey-white cardstock to my Dare 2B Artzy paper leaving about an inch in between the two white panels. I used some lime green embossing powder and stamped the Monday sentiment from the Perfect Blend stamp set with some Versamark and heat set it. The lime green really pulls out the green in the Blissful Blooms paper. I used the Dare 2B Artzy Perfect Blend stamp set and stamped the large coffee cup twice. Once on some Dare 2B Artzy Paisley Paper and also on some white cardstock using the Dare 2B Artzy Totally Black ink. I fussy cut the top and bottom sections of the cup and glued them to the white cardstock version of the cup that I stamped. I used the Dare 2B Artzy matching coffee cup die and cut the cup out with my die cut machine. To give it a bit of color and shading, I used my B0000 copic marker and added a bit of color to the lid and sleeve on the cup. Since, I felt like the sleeve needed a bit of decoration. 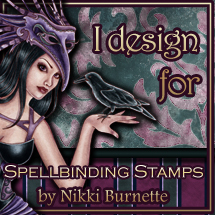 I looked around through all my Dare 2B Artzy stamps and discovered that the tiny border stamp from the Dare 2B Artzy Butterfly Tangle Jumpstart stamp set and used that to stamp a little top and bottom border on the sleeve of the coffee cup using some blue ink. I love how cute the decoration looks on the sleeve. Next, I used some beige ink and stamped the steam curls and then die cut it using the matching steam die. I added a bit of clear Wink of Stella to the steam to give it some sparkle. I added some dimensional foam to the cup and placed it onto my card front. For my embellishments, I used a metal butterfly embellishment that I’d picked up at a local Hobby Lobby store. It had been in my craft stash for a while and I was looking for the perfect project to use it on. I thought that the butterfly added o the card front gave it a bit of interest and dimension. I also used some small iridescent floral sequins called Central Park Daisies from Studio Katia and glued them to my card front. These little sequins are so fun for adding interest to your cards and I love the colors too. The entire panel was added to some 110lb gray cardstock using some dimensional foam. I’m excited to once again be participating in this phenomenal hop with Dare 2B Artzy and Coffee Loving Paper crafters. It’s a blast and there’s so much inspiration in this hop. I hope you’ll take a minute to hop on over and check out the Dare 2B Artzy blog this week and see what our talented Design Team has shared. There are some beautiful projects. Again, Dare 2B Artzy is a super sponsor so there is an awesome prize up for grabs ($20 Gift Certificate + 1 Stamp & 1 Ink Pad of your choice) but you need to participate in the hop to win. Share your Summer themed coffee card and get in on the fun. Dare 2B Artzy is offering a 10% discount during the hop on all coffee and tea themed stamps. You can check them out here. Thanks so much for stopping by! I’m off to hop around and see all the fun projects! Love how you used that border stamp on the sleeve! Great card! What a beautiful design and such a great sentiment. Love all the patterned papers and the beautiful butterfly! This is terrific! Love the colors! This is beautiful and I just love the colors. Also love that pretty paper!! What a gorgeous layout and such fantastic dies and papers. I just love your work. This is so so beautiful! Love those papers and the colors and that cup is awesome!